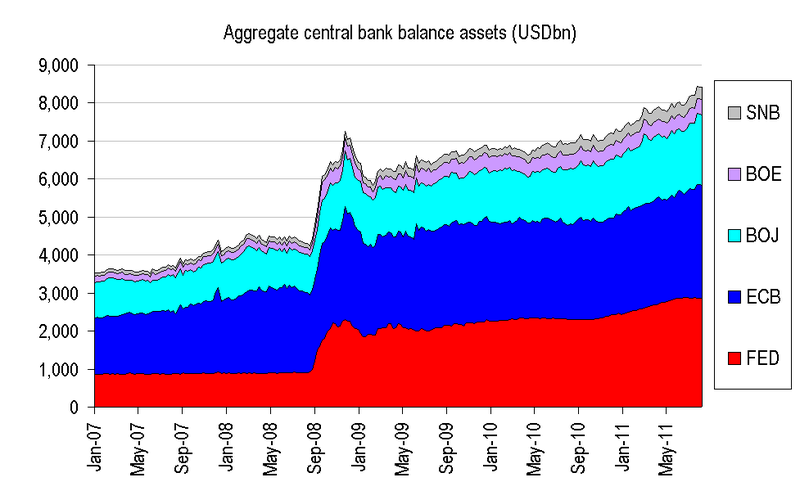 Is this the QE you were looking for? 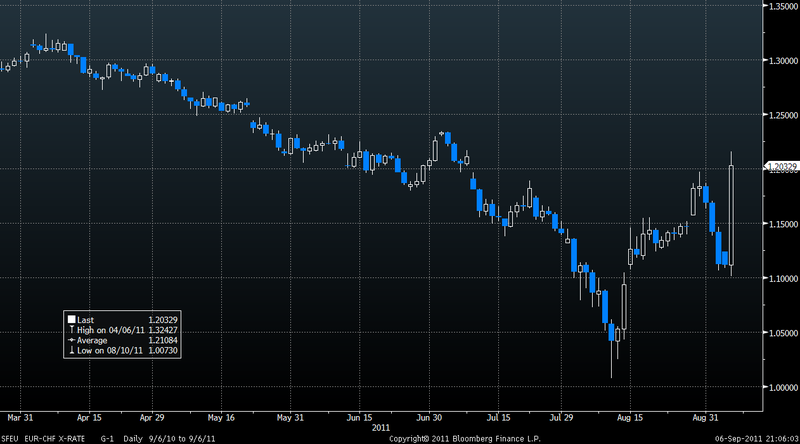 Despite the fact that sequels are never as good as the original, markets have been fixated on the QE series this year. First, the focus was on the end of QE2 and what it meant for risk assets; most recently the chatter has been specualtion about a QE3. 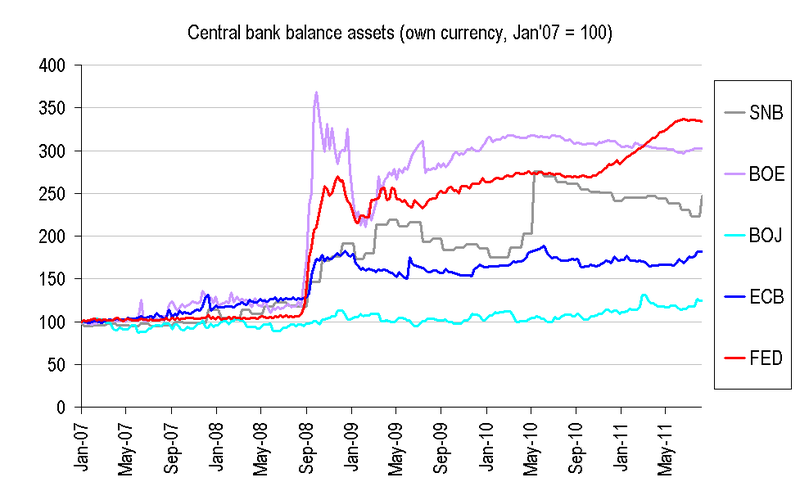 If we use market FX rates to convert the big five balance sheets into USD terms, you can see that central bank balances sheets have just about doubled since mid 2008. Today brings still more QE. Annoyed by the expensive CHF, the SNB is (again) trying to move their currency. This time, they have announced a commitment to keep their currency at a minimum level of 1.2 against the EUR (that is, a 1.20 floor for EURCHF).So far, they have suceeded. To keep it there, they are going to have to be an ongoing seller of CHF – and buyer of everything else. If the European crisis keeps rolling on, I imagine their balance sheet will swell up quite rapidly. 7 Responses to Is this the QE you were looking for? The SNB certainly drew a line in the sand last night. Surely this is one of the most extraordinary statements to come out of a central bank in recent years…. The current massive overvaluation of the Swiss franc poses an acute threat to the Swiss economy and carries the risk of a deflationary development. The Swiss National Bank (SNB) is therefore aiming for a substantial and sustained weakening of the Swiss franc. With immediate effect, it will no longer tolerate a EUR/CHF exchange rate below the minimum rate of CHF 1.20. The SNB will enforce this minimum rate with the utmost determination and is prepared to buy foreign currency in unlimited quantities. Even at a rate of CHF 1.20 per euro, the Swiss franc is still high and should continue to weaken over time. If the economic outlook and deflationary risks so require, the SNB will take further measures. Can you imagine Glenn Stevens saying such a thing in your wildest imagination? no, but the SNB have a few advantages. most of all, their cost of funds is -ve – so their portfolio is going to be positive carry (even US yields will pay a +ve running return) — the RBA would need capital from the Treasury to do that, as their cost of funds is target -25bps, and unless they took EUR periphs or EM, they’d be buying bonds with a yield below that rate. That is exactly what the Fed should do, but in a different, hypothetical market. “We will buy unlimited number of NGDP futures contracts to ensure NGDP growth of 5% p.a. on level basis” Yes. Central banks can move and shake. They just need a new framework and language. That certainly is some “new language” from the SNB! sorry the point i am making is policy needs to set expectations on the right path. that path needs to be well defined. the swissies got that right. the market adjusted accordingly. it will be interesting to see how this washes out in terms of ch ngdp / rgdp over the course of the next few qtrs. in the 70s they got quite a bit of inflation. i don’t know about ngdp futures, but there’s no doubt that the fed could do something like this IF they were determined. but they are not, they are divided.